24x30 original oil painting realism. $265.00 Hurry, only 1 remaining! Sorry I'm Away for three months Vacation. You can Contact me for any questions. Thank you, Please come Again! 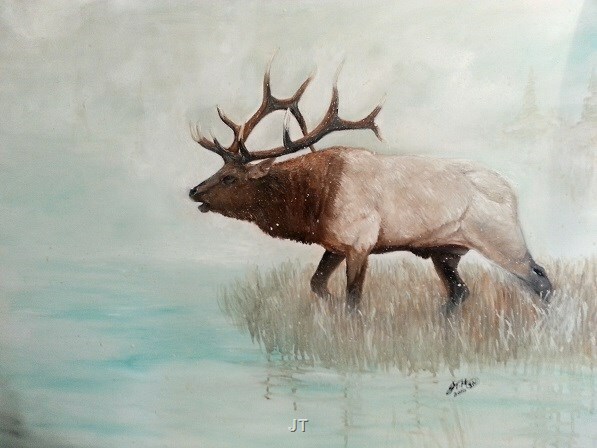 On a cold snowy day a lone bull elk makes a haunting call through the storm just before he crosses the water. Inspired by these beautiful animals I painted this one on a cotton stretched canvas with professional oil paint. It is signed and dated on the front and selling unframed ready to hang. Can be framed easily. I custom package for safe shipping.